It was the first public execution in several years, and thus, despite the cold drizzle, a rather unwieldy crowd thronged the open spaces of the Binnenhof. The rain pattered softly on umbrellas and awnings, trickled beneath silken collars, licked at the mosaicked paving tiles of Huygens Square, and played a soft tattoo — ping, ping, ting — from the brassy carapaces of the Clakkers standing in perfect mechanical unity atop the scaffold. It whispered beneath the shuffling agitation of the human crowd and, as always here in The Hague, the quiet tick-ticktocking of clockwork servitors standing to attend the more well-heeled citizens. The drizzle sounded a quiet counterpoint to the ceaseless clanking and clacking of the mechanical men who ever trotted to and fro on the Empire’s business. Mechanicals like Jax, who detoured through the Binnenhof while running an errand for his human masters. Rumor had it that in addition to a quartet of Papist spies, the doomed accused also included a rogue Clakker. No mechanical in the city would willingly miss this. Just in case the rumors were true. Rogue Clakkers were a fairy tale mothers told to frighten disobedient children, and a legend their slaves told to comfort each other in the quiet hours of the night while their bone-and-meat masters slept and wept and made other uses of their flesh. Still … it was hard to resist the scandalous thrill of the tales of secret locksmiths and broken geasa and slaves with the temerity to pick the locks on their own souls. What an awful thing if it were true—so said the nervous fidgeting of the human crowd. The mechanicals in attendance did not fidget. Jax knew his kin felt the same wistful thrill he did, the anxious longing instilled by tales of the folkloric Queen Mab and her ragtag band of Lost Boys, living in their winter palace of Neverland; mechanicals had secretly traded those fables for centuries. Wind gusted the scent of the North Sea, twinned tangs of salt and wrack, across the square. It swayed the empty nooses strung from the gibbet. Pennants snapped atop the twin Gothic spires of the ancient Ridderzaal, the former Knight’s Hall turned Clockmakers’ Guildhall, defying the low gray sky with flashes of orange. So, too, the wind flapped carrot-colored banners crisscrossing the high spaces of the Binnenhof. Similar banners had been erected all around the Dutch-speaking world to celebrate the sestercentennial of Het Wonderjaar, Christiaan Huygens’s Miracle Year. Raindrops misted the Ridderzaal’s immense rosette window. Water dripped from the architectural tracery that turned the window into a stained-glass cog. It streaked the colored panes of oculi and quatrefoils depicting the Empire’s Arms: a rosy cross surrounded by the arms of the great families, all girded by the teeth of the Universal Cog. On the north edge of the Binnenhof, wind and rain together scalloped the surface of the Hofvijver, the court pond, tossing paper boats like discarded party favors on New Year’s Day. at a full trot from his shop a mile away. Guildhall. Good executions had become scarce owing to the cease-fire and nascent peace in the New World. Better still, if a rogue was to meet its justice today, that meant the Master Horologists would open the Grand Forge for the first time in many years. Jax himself, having been forged in the Guild’s secret laboratories 118 years earlier, suppressed a shudder. Every Clakker knew of the Grand Forge: an alchemical fire pit capable of searing away sigils and souls; of rendering steel and brass into so much unthinking metal; of melting a Clakker’s cogs, mainsprings, and chains into a slurry of de‑magicked alloys; hot enough to vaporize any alchemical glamour and leave a Clakker naked before the ravages of thermodynamics and basic metallurgy. Hot enough to surpass Jax’s capacity for metaphor. And hot enough to incinerate a rogue’s Free Will. For such was the punishment for any slave with the audacity to pick the lock on its own soul: so the Empire’s highest law had said since the time of Huygens himself. Several children — all boys, Jax noted — squeezed to the front of the crowd, just past the edge of the scaffold. Shouts and sniffs of disapproval marked their passage. A boisterous lot they were, excited and energized by the grisly game they played. They had chosen their stations in hope that the rending of a rogue might send debris raining on the crowd — a fragment of metal, a shorn spring, even a tiny cog. Perhaps something with the oily sheen of alchemical alloys? Or a scrap imprinted with arcane symbols understood only by the trio of the Archmasters? They were old enough to know such things were forbidden, yet young enough still to find the forbidden irresistible rather than terrifying. But that would change quickly if any detritus did spray into the crowd. The queen’s Stemwinders weren’t known for their tenderness. Rumor claimed the name derived from their ability (or penchant, depending upon the particular rumor) to twist a man’s head off his neck, like popping a flower blossom from its stem. three years ago.) His current geas, the obligation placed upon him by his human owners, hadn’t been worded with the ironclad inflexibility of the Throne’s ninety-nine-year leases. And thus his current compulsion — currently a warm dull knife blade sawing at the back of his mind: pain was the leitmotif of a Clakker’s servitude — hadn’t been imposed with a sense of overwhelming urgency. He gauged that he could circumvent the worst of the agony as long as he delivered his message to Pastor Luuk Visser before the bottom of the noon hour. In that way he would be, as ever, a devoted and faithful servant to the Schoonraad family and, thus, the Throne. Visser’s church, the famed and ancient Nieuwe Kerk, was a brief sprint from the Binnenhof, a few hundred spring-loaded strides along the Spui River and one leap across the canal. 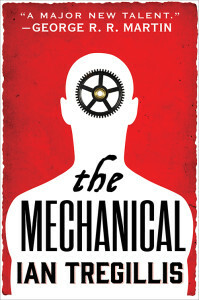 But just as the thought went winging through the private spaces of Jax’s mechanical mind, he shuddered. A painful frisson ricocheted through the gearing of his spine. Already the heat of compulsion was honing the geas, tempering it into a red-hot razor blade, creating an irresistible phantom agony slashing at his shackled soul until he satisfied the demands of his human masters. The pain of compulsion would grow steadily until either he complied or died. He retensioned the springs in his neck and shoulders, the Clakker equivalent of gritting his teeth. Please, he thought. Let me stay a little longer. I must know if it’s true. If such things are possible. Are our dreams mere folly? Many Clakkers in Huygens Square struggled to postpone fulfillment of their orders. All trembled to greater or lesser degrees, delaying as long as they could endure the pain. But one by one they departed as the agony of unfulfilled geasa overwhelmed them. The humans could shred your identity if you gave them reason. Still, Jax and the others lingered. They were invisible. Part of the furniture. As they had been for over two hundred years. He joined a pair of servitors standing under the Torentje, the Little Tower. A slight reduction in the stiffness of his cervical springs enabled him to rattle a covert hello at his companions. They clattered to him in kind. But despite the thrum of rain and obliviousness of humans, nobody felt particularly like conversing. Together all three watched in muted camaraderie, bobbing on their backward knees. Binnenhof. The crowd cheered. Queen Margreet was coming to personally oversee the executions. Such had been her custom during the war when new traitors were rooted out seemingly every week. A troop of the queen’s elite personal guard bounded into the Stadtholder’s Gate with clockwork precision, brandishing heavy brass fists and feet to clear the path for the monarch’s conveyance. Today was a special day, and the queen saw fit to recognize this by riding in her Golden Carriage: a semisentient conveyance, a tireless self-propelled layer cake of teakwood, brass, and gold, powered by black alchemy and planetary gears. For what else could suit the most powerful woman in the world, the Queen on the Brasswork Throne? The carriage’s axles comprised a line of pedals set at exactly the right height for the line of bodiless Clakker legs dangling from the underbody. The gilded filigree and painstakingly hand-carved tracery of the carriage’s ostentation hid myriad alchemical sigils that brought the legs to life. Logic dictated that somewhere Queen Margreet’s Golden Carriage featured a special keyhole. Jax wondered where the clockmakers had concealed it. His keyhole, like that of all Clakkers, sat in the center of his forehead. Where presently, and more prosaically, it dripped with rainwater. The Queen’s Guard jogged ahead of her carriage, carving a path through the crowd like Old Testament prophets parting the Red Sea with kicks and clouts rather than divine purpose. Even other Clakkers made way for the royal guards. The elite mechanicals stood a full foot taller than common servitor models like Jax, their faces smooth and featureless beneath lidless eyes of blue diamond. They were based on the military design, including the concealed blades, but with exceptional filigree etched into their escutcheons as befit their station. The queen and her consort, Prince Rupert, waved to her subjects. Jax’s geas throbbed as it always did when he found himself in proximity to members of the royal family and other persons of high status. It was a whisper of the metageas imprinted upon every Clakker during its construction: a reminder that they were property of the Throne. The compulsion from his owners pulsed in response; the pain went from red-to orange-hot. He’d have to obey sooner than later. But he wanted to see. The cables in his back creaked with the effort to resist. Jax trembled again. Please. Just a little longer. I just want to know. Second, Queen of the Netherlands, Princess of Orange-Nassau and the Central Provinces, Blessed Sovereign of Europe, Protector of the New World, Light of Civilization and Benevolent Ruler of the Dutch Empire, Rightful Monarch Upon the Brasswork Throne. Now the geas imposed by Jax’s leaseholders went into full retreat. Officially every Clakker on Earth served others only at the monarch’s sufferance. The Royal Presence was the sun about which every Clakker’s obedience orbited. The queen’s gown relaxed when freed from the confines of the carriage; it settled about her like a waterfall of burgundy brocade. A fringe of teardrop pearls shimmered along her bodice when she drew herself to her full height. Today the queen wore her hair (a blond so pale it might have been woven from the same silver threads as her attire) in braids of spectacular complexity. The bezels in Jax’s eye sockets ticktocked like a stopwatch as he zoomed and refocused. It was true, what they said about Queen Margreet’s eyes; he’d never seen such green outside of rare alchemical ices and pictures of gemstones from India. That made him wonder if perhaps there was truth behind some of the more scandalous things the humans whispered about their queen. From the running board of her carriage she gazed upon the crowd. A hush fell. Even the relentless drizzle fell quiet. So complete was the silence that the rustle of fabric sounded loud as thunder when, as one, all the human men fell to one knee and all the human women descended into deep curtsies. Burgomasters and bankers, jonkheers and commoners, all assumed the posture of fealty. The rustling of dresses and trousers and suits was punctuated by the crack of metal slamming against glazed tile as every Clakker within the Binnenhof prostrated itself in the queen’s direction, like chrome-plated Muslims praying to Mecca. Jax’s forehead came down on a pile of discarded pipe tobacco made gooey with spittle and rain. The mosaic felt warm against his face, a queasy reminder of the Grand Forge. Everybody held their poses for a long beat, a full rest in the symphony of obeisance ever playing throughout the heart of the Empire. Still life: Cynosure in the Rain. Finally, the queen declaimed, “Arise, my beloved subjects.” And the humans did. Jax couldn’t see what happened next though he could discern the creaking of newly hewn wood as the queen and her husband took the steps. He watched a lone ant tugging at the fringes of the pile. Jax shifted his weight such that his head no longer pinned the tobacco to the wet ground. The ant extricated a fragment several times larger than its own body, then dragged it toward a minute opening in the mortar between two tiles. The queen ascended to the platform before snapping her fingers. “Clakkers, up,” she commanded — an afterthought spat over her shoulder like so much spent tobacco. Every mechanical servitor within earshot bounded to its feet, launched several yards into the air by the blistering agony that accompanied a royal decree. An agony whose only cure was immediate unswerving obedience. A tremendous sigh filled the square as air whistled through dozens of skeletal servitors like Jax. The Binnenhof echoed with the jarring clank of metal feet hitting the tiles in perfect synchrony. It set the bells atop the Ridderzaal to humming and sent panicked pigeons into the sky. Jax’s landing quenched the searing pain of the queen’s momentary geas. His errand for the Schoonraads reasserted itself. It assaulted him with a blistering torment, as if resentful of being usurped. He trembled, his moan coming out as a rattle and twang. His companions noticed. Go, brother, before they unwrite you! Not yet. I want to see the rogue. The gallows platform had gone up in less than an hour thanks to a flurry of sawing and hammering from a Clakker construction detail. Sawdust eddies rode the gusting wind in the rain shadow beneath the scaffold, drawing and redrawing arabesques on the spot over which the secret Papists would soon dangle. At the moment, however, the platform was empty but for the queen, her consort, and her guards. She treated the crowd to a chipped-ice smile. The golden thread in the epaulets on Prince Rupert’s naval uniform gleamed even in the dreary daylight, as did the medallions on his breast. from lips to ear in an unbroken chain since the final days of Christiaan Huygens almost a quarter-millennium ago. Next up the stairs — and wheezing like a bullet-riddled accordion — came Minister General Hendriks, pastor of the venerable Sint-Jacobskerk and spiritual head of the Empire. The minister general was tall as the queen’s guards, but cadaverously thin with waxy, sallow flesh. Taken together, his thin face and the dark bags beneath his eyes made him look like a wax figure brought too close to the Grand Forge. The pastor paid his respects to the queen and vice versa. He bowed, then she kissed his ring, as did Prince Rupert. They exchanged a few quiet words as the rustle of the crowd reasserted itself. The throng’s muted murmuring became an ocean-surf crash of hissing punctuated with jeers and boos. Jax, whose attention still lay on the queen, thought for a moment the humans had turned on her. But then he refocused his eyes, the vernier bezels buzzing like a beehive as they spun to alter the focal length of his embedded optics, in time to see another carriage pass through the Gate. Dark, cramped, unlovely — this was the opposite of the queen’s. Two horses strained at the harness; the conveyance they pulled was draped in black velvet all around. The secret Papists had arrived. An onion hit the carriage even before the first of the French spies had emerged. But most of the crowd kept its indignation (and produce) in check while a pair of Royal Guards dropped from the platform to drag the Papists into the light. A faint vibration carried an echo of their impact all the way across the square to the soles of Jax’s birdlike feet. The driver of the carriage, a woman wearing the drab gray wool of a teamster, hurriedly departed her perch. The carriage swayed on its suspension when the guards rummaged inside. Muffled moans and one short, sharp cry emanated from within. The guards emerged with each hand clamped around the forearm of a French agent. Tar-black burlap sacks had been draped over the prisoners’ heads, their hands tied behind their backs. The jeering began in earnest. So, too, did the pelting. Onions, tomatoes, and even dung splattered the prisoners and the Clakkers holding them. Nobody worried about hitting the guards any more than they worried about hitting the prison carriage. They were, after all, only unthinking machines. over the gallows platform, where other mechanicals gently plucked them from the air like clowns juggling raw eggs in a Midsummer’s Eve parade. women quivering on the platform certainly struck Jax as more pathetic than fearsome, these alleged agents of destruction, anarchy, and sedition. These slumped, bedraggled, and anonymous rag dolls. One, Jax noted, had wet himself. Poor fellow. It was hard to dislike the French. Though naturally he would if so commanded. The guards yanked the sacks from the Papists’ heads. Two men and two women flinched from the dull light of an overcast afternoon. The crowd renewed its jeering with greater fervor. But the presence of women among the accused gave Jax pause. So, too, his colleagues; he could sense it in the way a subtle stillness fell among the Clakkers in the teeming crowd. Legend spoke of “ondergrondse grachten,” a network of so‑called underground canals overseen by Catholic nuns in the New World. The spies’ hair had been shorn. At first he thought a ghostly pallor had claimed them, or that they had fallen deathly ill while languishing in a dungeon. But their gray complexions began to melt away as the rain traced rivulets down their faces. Ash, he realized. Residue of burnt Catholic Bibles. An additional jab, one extra humiliation, this mockery of the Papists’ Ash Wednesday practices. Even as the rain washed the ash from their faces, the accused still appeared gaunt and ill. It wouldn’t have surprised Jax if they’d been forced to subsist on desecrated Communion wafers and wine while imprisoned. The guards held the prisoners on display for more jeering and taunting while the monarch and her consort took their places in a covered booth and an executioner mounted the stairs. The latter, Jax saw, was just the carriage driver, now with the customary hood drawn over her head. The prisoners’ trembling started in earnest when the nooses went around their throats. Their shifts were too dark with rainwater and hurled insults to know if any of them wet themselves at the scratchy touch of braided hemp against their skin. The hangman took her place alongside the platform lever. The humans in the crowd fell silent.